As one of the original founders of the American Indian Movement (AIM), Clyde Bellecourt has been an activist for the rights of Native Americans for many years. Many have questioned Bellecourt's methods, but no one questions his dedication to improving the lives of his people. 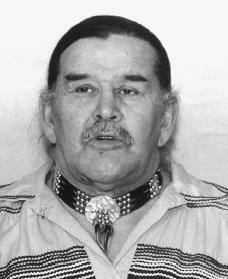 Clyde Bellecourt was born in 1939 on the White Earth Indian Reservation in Minnesota, one of many tracts of land set aside by the United States government for Native Americans. He was the seventh of twelve children born to Charles and Angeline Belle-court, who were members of the Ojibwa tribe. His father had fought in World War I (1914–18), a destructive war that involved many European countries and the United States, and suffered injuries that prevented him from working. The family lived in a small house and was very poor. Bellecourt had problems in school and eventually dropped out. He was angry that Native Americans, if they were talked about in school at all, were usually described as killers or savages. Bellecourt said that he could not consider George Washington (1732–1799) the father of the country because Washington did not look anything like Bellecourt's father or grandfather. After quitting school and failing to find work, he became involved in burglaries and robberies and wound up in prison. In prison in Minnesota, Bellecourt had given up hope. He decided to go on a hunger strike, figuring he would die. A fellow inmate brought him a book dealing with his Ojibwa history. Reading the book made Bellecourt proud once again to be a Native American and filled him with hope. He began relating what he learned to his fellow inmates. As he said to Peter Matthiessen in In the Spirit of Crazy Horse, "I guess we had the first real Indian Studies program in the country." After his release from prison, Bellecourt and two others founded the American Indian Movement (AIM) in 1968 to educate even more people and to work for improved conditions and rights for Native Americans. The organization established job training, education programs and youth centers, forced the government to improve public housing for Indians, and set up schools such as the Heart of the Earth Center for American Indian Education in Minneapolis, Minnesota. The center focused on American Indian history and traditions. However, in the early 1970s AIM often took extreme measures in its attempts to call attention to the Native American cause. Belle-court and others presented a list of twenty demands to the U.S. government during an armed takeover of a Bureau of Indian Affairs building in 1972. These demands included a separate government for Native Americans, the return of many lands to their Native American owners, the drawing up of new treaties between the United States and the Native Americans, and the creation of a special agency in Washington, D.C. for the rebuilding of Native American communities. A similar armed takeover occurred in 1973 at Wounded Knee, South Dakota, which had become a national symbol after the release of Dee Brown's book Bury My Heart at Wounded Knee (1971). While many of the group's demands were not met, these incidents called attention to the problems facing Native Americans and forced the government to address them. working secretly with the U.S. government. The brothers denied doing anything wrong, saying the charges were made up by other members of the movement who wanted their power. The American Indian Movement split into two groups as a result. Bellecourt remains active in trying to improve the lives of Native Americans, emphasizing the need for more and better education. In 2001 he called for changes in the Minneapolis public school system after a study showed that only 15 percent of American Indian students who entered high school in 1996 graduated four years later. Bellecourt is the current director of the Peacemaker Center for Indian Youth, chairman of the Heart of the Earth Center, and organizer of the National Coalition on Racism in Sports and the Media. Nabakov, Peter. Native American Testimony: A Chronicle of Indian-White Relations from Prophecy to the Present, 1492–1992. New York: Viking Press, 1991.
that is not the way to spell my families name there are many ways to spell that name but the original way is "Belcourt"